Making a toy programming language in Lua, part 1 at Play With Lua! In this post, and the following posts in this series, I aim to fix something that’s bothered me for a while: writing a parser in Lua isn’t very approachable. In C you have the excellent chapter in The Unix Programming Environment (probably the best book on programming ever written) about how to use Lex and Yacc. For Ruby there’s the excellent Dhaka gem, as well as Racc, both of which work a lot like Yacc / Bison. There’s also Antlr, which seems to speak to every language except Lua. Meanwhile Lua has LPeg, which is used nothing like Yacc, and tutorials are thin on the ground. So, I want to change that. This is going to be about how to make a toy programming language in Lua, in three parts. I’m going to loosely follow what the Lex / Yacc chapters of The Unix Programming Environment do, and we’ll end up with the same language. Now that we have it loaded, let’s start making a parser. Parsers are made up of patterns, which are objects (userdata) that match certain things in strings. Each pattern has a set of things that it will match, and a match method that takes a string and returns whether it matches or not. It knows how to parse “apple” but what comes after it it doesn’t match, so it leaves it alone. (note that we can use literal strings and numbers, and it’s just as if we called lpeg.P. I’ve split it into multiple lines to make it clearer. Let’s walk through this: we start by having “-” matched at most 1 time (exponentiating by a negative means “repeated at most,” exponentiating by a positive or 0 means “repeated at least”). This allows us to have negative numbers. Then, we have at least 0 repetitions of lpeg.R('09'): this is a “range” pattern, which matches any character between the two, so, any digit. This is the integer part of the number. Then there’s a block wrapped up in parentheses: ( ... )^-1. Again, we’re repeating this portion at most one time, and that portion is a “.” followed by another series of digits. Finally, we match end-of-string. Up until now, we’ve been concerned with seeing whether a given string matches a pattern. But that’s something we could do (with this example anyway) using a regular expression. In order to make any sort of useful parser we’ll need to extract portions of the string, while recognizing what they are. In this case, we’ll want to extract the integer part of the number, the fractional part, and whether there’s a negative sign. sign, ipart, and fpart are now “-“, “37”, and “7” respectively: instead of returning 6 (the index right after the match), a pattern with captures returns the captures. This will capture the whole thing at once, and feed it to a function that happens to be in the standard library that turns a string into a number. Call this on a filehandle (defaults to stdin) to read, evaluate, and print simple exprs. A grammar is made by passing a table to lpeg.P. The first element in the table is the name of a nonterminal, and it’s what we start by trying to match. All the rest define nonterminals. In order to reference a nonterminal, we use lpeg.V. Start trying to match an EXPR. An EXPR is either a TERM plus-or-minus an EXPR, or it’s just a TERM by itself. When you see an EXPR, send it to eval. A TERM is either a FACT multiply-or-divide a TERM, or a FACT by itself. Send these to eval also. A FACT is either an EXPR in parentheses, or a number. These, too, get sent to eval. 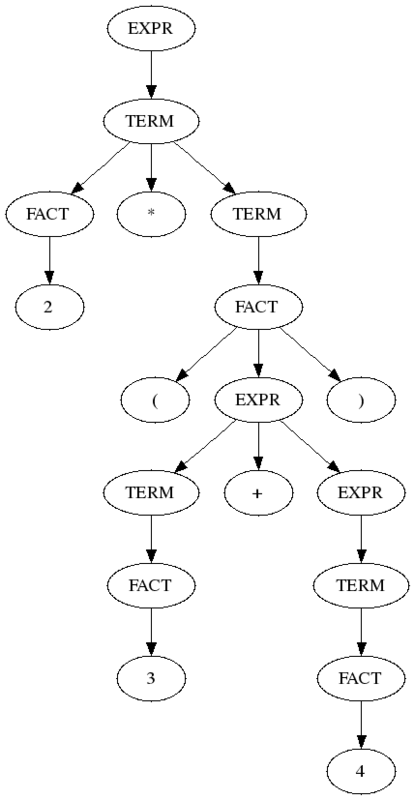 The reason we separate out EXPR, TERM, and FACT (expression, term, and factor) is that LPeg has no other way of assigning operator precedence: if an EXPR’s middle operator could be either a plus or a multiply, then “2+3*4” would generate the same tree structure as “2*3+4”. So, we have some extra internal nodes in there. If we wanted, we could eliminate a lot of them by having the rules not be recursive: EXPR could be a series of TERMs with operators, instead of a single TERM followed by an EXPR. That’s what the LPeg example has. However, I’m trying to closely follow what The Unix Programming Environment does, and demonstrate that recursion works. If you try this out using the same repl function as before you’ll see they all work. At this point we have something about like the first version of the calculator in The Unix Programming Environment. The next step, which will be in the next post, will be to add variables and control structures. As always, you can get the code from this post (for the final version of this parser) here.